Congratulations to the students in the Jenkins Honors Moot Court Competition who have moved on to the semifinal round of the competition. The students will be competing tomorrow, Sunday, April 7 at 10 a.m. to determine which two teams will be advancing to the final round on Thursday, April 11, at 5:15 p.m. 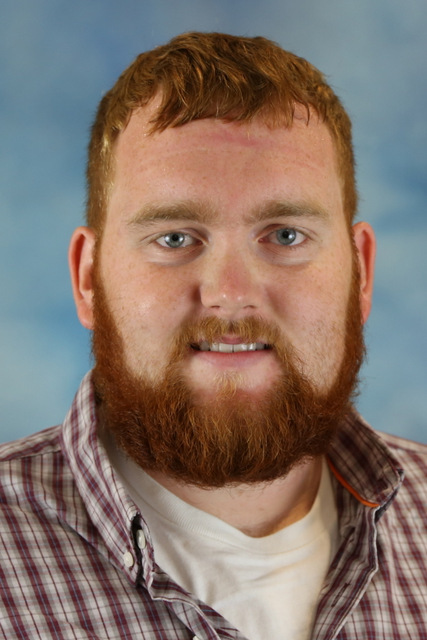 The final round of the Jenkins competition will take place on Thursday, April 11, at 5:15 p.m. in the Lubar Center. The final round will be judged by The Honorable Charles Wilson (U.S. Court of Appeals for the Eleventh Circuit), The Honorable Daniel Kelly (Wisconsin Supreme Court), and The Honorable Lisa Stark (Wisconsin Court of Appeals). The event is free and open to the public, but registration is required. You can register with this on-line registration link. Congratulations to all the participants in the competition. Thank you also to all the alumni and other attorneys and judges who volunteered to grade briefs and serve as judges in the four preliminary rounds and in the quarterfinal rounds. We appreciate their time and assistance every year. Congratulations to the students in the Jenkins Honors Moot Court Competition who have moved on to the quarterfinal round of the competition. The students will be competing on Saturday, April 6 at 2:30 p.m. to determine which teams will be advancing to the semifinal round on Sunday, April 7 at 10:00 a.m.
Congratulations to all the participants in the competition. We also very much appreciate the alumni and other attorneys who volunteered to grade briefs and who served as judges in the four preliminary rounds. We appreciate their time and assistance every year. The final round of the Jenkins competition will take place on Thursday, April 11, at 5:15 p.m. in the Lubar Center. 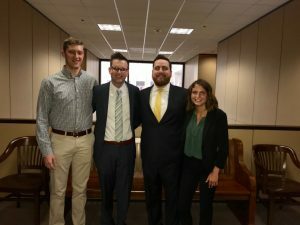 The Marquette Sports Law Moot Court team advanced to the Octofinals of the 2019 Mardi Gras Sports Law Invitational Competition hosted by Tulane University Law School. Please congratulate team members Killian Commers, Hannah Compton, and Alexander Hensley. Professors Matt Mitten and Paul Anderson coached the team. Kara Coppage and Tyler Coppage, who are former MU Mardi Gras Competition team members, coached and traveled with the team. Tyler is pictured with the team. 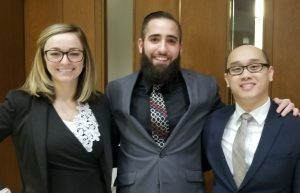 Thirty teams from across the country arrived in Boston at the Boston Municipal Court Department on February 28, all prepared to present oral arguments in the National Appellate Advocacy Competition (NAAC) regional. Two Marquette Law teams were among those and both made an impact. Jad Itani, Elizabeth (Lizzy) King, and Travis Yang were seeded 13th after three rounds of argument. They advanced to the fourth (regional semifinal) round but faced a tough bench while arguing respondent’s side, a tough argument in the context of the Eighth Amendment issues presented. They lost that fourth round. 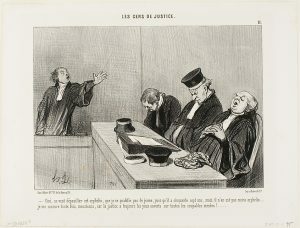 King had a strong performance at oral argument in the second round, despite battling some unfortunate shellfish poisoning; Itani had to sub in for her in the third and fourth rounds, despite not having argued that side at all. Their team’s brief was named third best in the region. Elizabeth (Libby) Grabow, Zeinat Hindi, and Anna Meulbroek were seeded 3rd after three rounds, but they, too, faced a tough bench in the fourth round. Unfortunately, they lost that round, but delivered consistently high-quality oral arguments in every round. After the third round, the judges commended them for their winning performance and encouraged each of them to continue with litigation work. 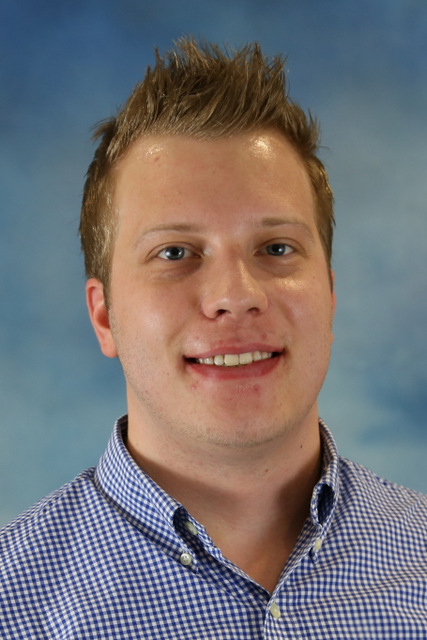 Their team’s brief was named fourth best in the region. This year was the first in memory where both teams advanced to the regional semifinal round and both teams received brief awards. Marquette has much to be proud of. Both teams were assisted by practitioner coaches Elleny Christopolous, Kate Maternowski, and Zachary Willenbrink (L’11). Thank you, too, to practice judges Professors Ed Fallone and Elana Olson; Judge J.P. Stadtmueller (L’67), law clerk Nathan Bader and law clerk Joan Harms; City of Milwaukee attorneys James Carroll (L’08), Bill Davidson (L’17), Patricia Fricker, Katryna Rhodes; Meredith Donaldson (L’18); and former NAAC competitors Lucas Bennewitz (L’15), Ali Klimko (L’17), Andrew Lawton (L’18), and Adam Woodside (L’18). Congratulations to team members for their outstanding representation of Marquette Law. The Jenkins Honors Moot Court Competition is the appellate moot court competition for Marquette law students and is the capstone event of the intramural moot court program. Students are invited to participate based on their top performance in the fall Appellate Writing and Advocacy course at the Law School. The Jenkins preliminary rounds begin March 30, 2019, with the winning teams progressing through the quarterfinals, then semifinals, to the finals. The final round will take place April 11, 2019. All rounds are open to the public. Stay tuned for more information. Correction (1/4/19): Earlier, this post said the final round was April 7, 2019; however, the correct date is April 11, 2019. While I was working into the evening on the third floor of Eckstein Hall, a friend stopped to catch up. On the table in front of me were piles of handwritten notes, highlighted cases, outlined arguments, and cheat-sheets, organized by Petitioner or Respondent. Color-coded flashcards were stacked in the corner. I was surrounded by seven-and-a-half weeks worth of sticky notes. I was a few days away from my moot court competition, and reviewing every single note card’s scribbled phrase, ensuring I was ready for any and all arguments from opposing counsel and questions from the judges. She gave me a sympathetic look. 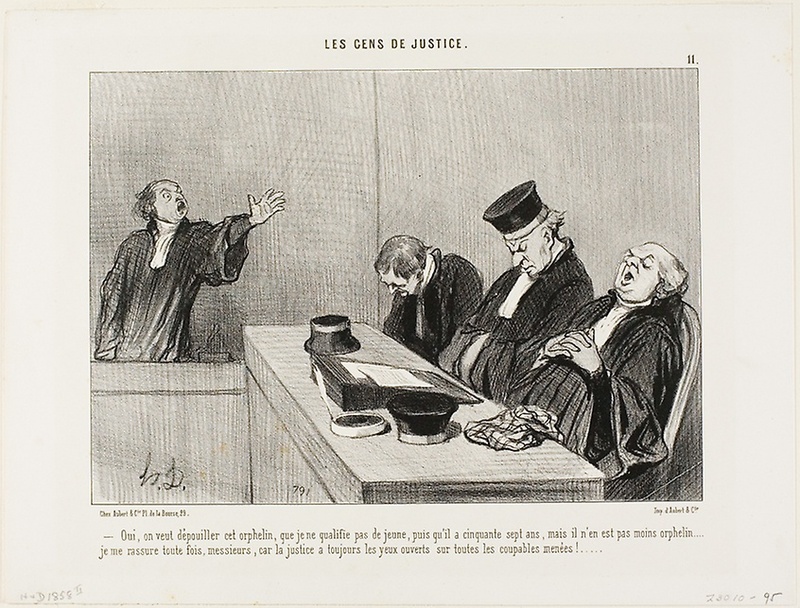 “Moot court,” I said. 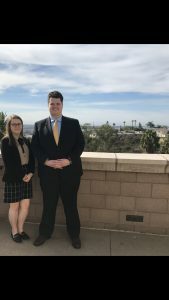 Congratulations to 3Ls Olivia Garman and Samuel Simpson for placing in the Octofinals in the National Criminal Procedure Tournament in San Diego. The team’s advisors are Professors Susan Bay and Thomas Hammer, and the team coaches are Attorneys Brittany Kachingwe, Sarah McNutt, and Mary Youssi. All three coaches are former Marquette moot court competitors. Marquette hosted the Region VIII round of the NMCC on November 17-18, 2018. 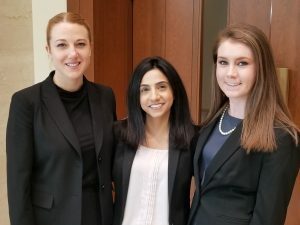 Please congratulate team members Jessica Delgado, Emily Gaertner, and Sarita Olson, who received the highest brief score in the competition and award for best Petitioner’s brief. The team advanced to the quarterfinals. 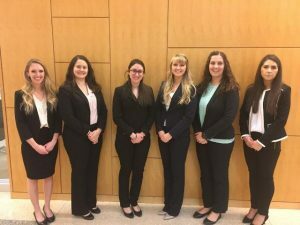 Professor Rebecca Blemberg advised the team, and attorneys Bryn Baker, Veronica Corcoran, and Chal Little coached the team. Please congratulate Claudia Ayala Tabares, Katie Bakunowicz, and Kelsey Stefka for placing in the semifinal round. I had the privilege of working with this team, and the team was coached by Attorneys Jason Luczak, Brianna Meyer, and Max Stephenson. We appreciate the judging assistance in the semifinal round of the Hon. Michael Aprahamian, Hon. William Duffin, Hon. Beth Hanan, Hon. Michael Halfenger, Hon. Nancy Joseph, and Atty. Brent Nistler. Congratulations to all the teams who competed in the quarterfinals. We appreciated the judges coming out to hear the oralists. Among the judges were a number of Jenkins and moot court alumni, including Natalie Schiferl, who came all the way from Minnesota to judge with her Jenkins partner, Mary Youssi. Best of luck to the semifinalists! Congratulations to the students in the Jenkins Honors Moot Court Competition who have moved on to the inaugural quarterfinal round of the competition. The students will be competing on Saturday, April 14 at 1 p.m. to determine who will be advancing to the semifinal round on April 15 at 1:00 p.m.
Congratulations to all the participants in the competition. We also very much appreciate the judges who grade briefs and participate in the preliminary rounds. This year we had two Jenkins alums, Attorneys Lindsey Anderson and Averi Niemuth, judging together in the preliminary rounds. One of the great things about moot court is how active our alums and volunteers are, and we appreciate their time and assistance every year. Welcome home to the Law School team that participated last weekend in the annual Duberstein Bankruptcy Law Moot Court Competition at St. John’s University in New York City. 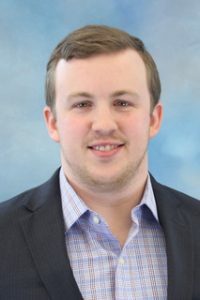 This is the first year that the Marquette University Law School has entered a team in the Duberstein Competition, which has a reputation for fierce competition and high quality judging. Our team of Jacob Heuett, Bradley Suiters and Alexander O’Reilly worked long hours to prepare for the competition, only to do battle with a Nor’Easter that closed airports in New York City and delayed their arrival until early Sunday morning. The storm interfered with the travel of numerous teams, and the competition organizers were forced to cancel the first round of arguments and schedule some teams to argue back to back. Despite facing adversity, our team performed admirably. While the team did not advance to the octo-finals, they set a foundation upon which future Law School teams can build. Special thanks to Len Leverson for serving as the team’s practitioner coach. Congratulations!